Despite this, both the number of accounts and the trading volume have increased. Japanese brokerage Gaitame.com has just reported its client and trading related metrics for the month of August 2015. 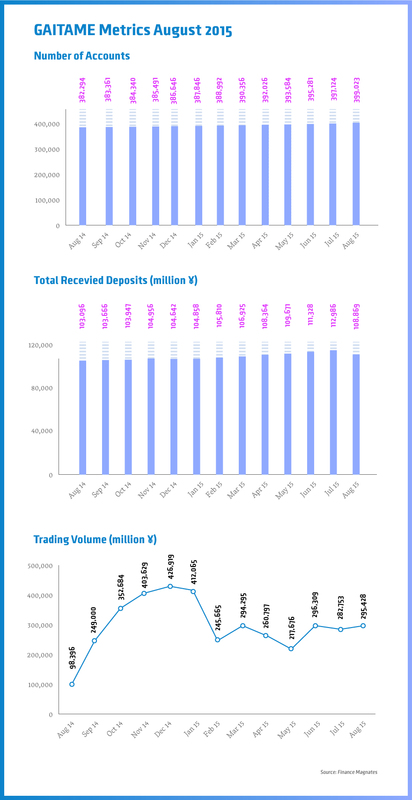 The most surprising data point is that the firm saw a decline in total deposits during the month, a figure that has consistently rose from month to month since the beginning of the year. The deposits figure is reported in Japanese yen and should not be affected by any recent exchange rate fluctuations. At the same time, the rest of the results continued to trend ever so slightly higher. Gaitame has reported an increased number of trading accounts which have grown by 1,899 in August, a very similar rate as in the previous month. Total client deposits have reached only ¥10.88 trillion marking a modest year-on-year growth of 6 percent. The trading volumes figures came out at ¥29.5 trillion, which is 4.5 percent higher than the previous month and a massive 200 percent jump compared with August 2014. The monthly rise in trading volume is likely to be related to the strengthening yen seen during late August which could have drawn more local interest in forex trading.